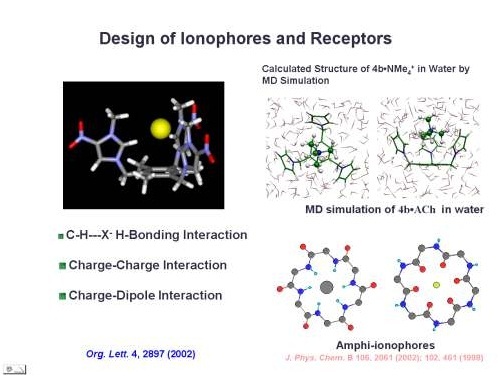 * Structure and dynamics of molecular clusters upon excitation, ionization, electron-capture, protonation/deprotonation, charge-transfer, and salvation. 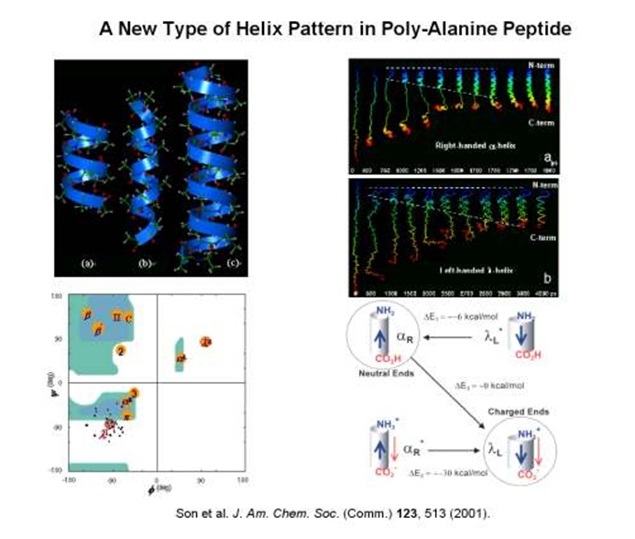 * Molecular recognition, self-assembling, and protein engineering based on molecular interactions including neutral/ionic H-bonding and pi interactions. 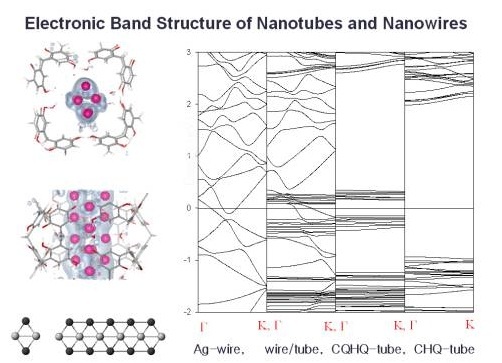 * Electromagnetic and optical properties of low dimensional systems including metallic/semiconducting nanowires, carbon nanotubes, graphene nanoribbons, organic nanotubes, graphene, and their analogs. 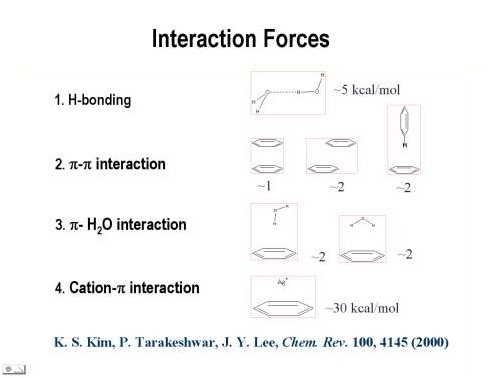 * Electron/spin transport phenomena in electronic/spintronic devices using non-equilibrium Green function and (time-dependent) density functional theory. 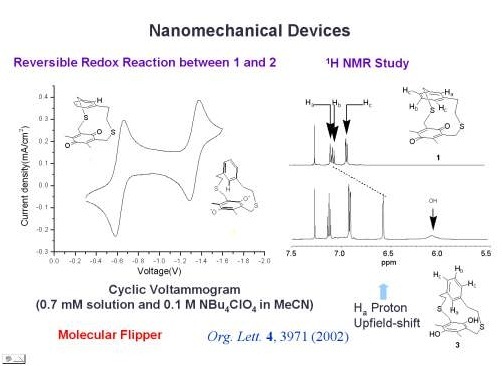 * Design of novel functional molecules, receptors, nanomaterials, electronic/ spintronic nanodevices, bimolecular sensing devices, and optical nanodevices New physical phenomena of super-magnetoresistance based on orbital matching/mismatching in addition to spin matching/mismatching. 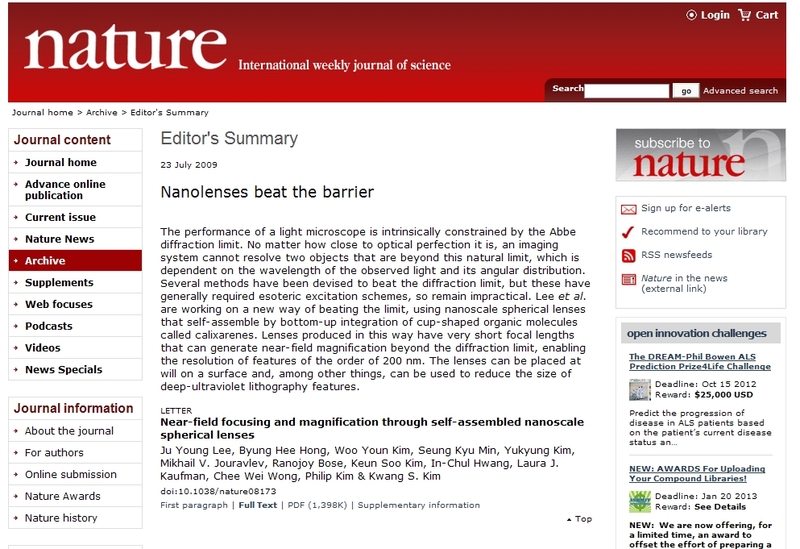 * Novel subwavelength diffraction phenomena by light-matter interactions in nano-optics. * Applications to green chemistry, atmospheric chemistry, and biochemistry for developing new materials and catalysts towards energy storage and understanding novel mechanisms of photoreaction and bio-metabolism. 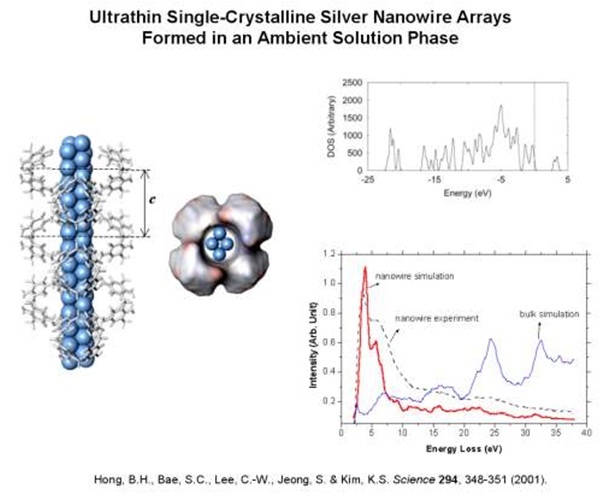 Nanomaterials/nanodevices are investigated through the trinity of i) prediction/analysis, ii) synthesis/fabrication, and iii) characterization/application. A new synthetic approach such as self-synthesis is utilized to synthesize nanomaterials. Both theory and experiments should be complemented, and both chemistry and physics approaches should be combined for the effective study. We create new paradigms for designing and developing innovative quantum molecular/nanomaterial systems with preconceived properties so that material itself can be an intelligent device. For practical utility, nanodevices need to be synthesized with the self-engineering techniques. Otherwise, the manipulation of each device is not practical, and the mass-production is not possible. 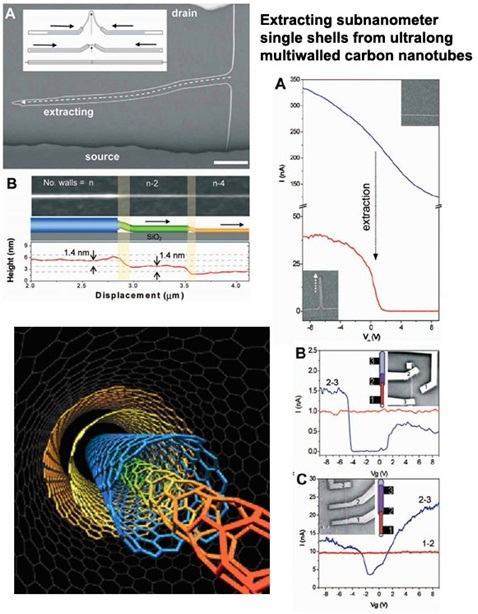 Understanding the intricacies of self-engineering and transport mechanisms will provide the platform that the analysis of structure-function relationship, molecular interactions/dynamics, and nano-recognition in low-dimensional space can be built on. 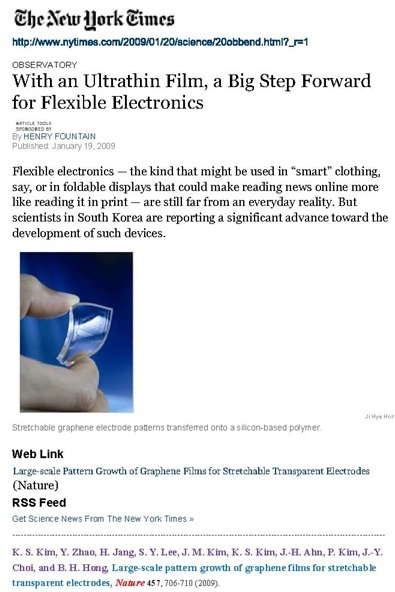 Recently, carbon-based devices have been realized in graphene with low carrier concentration and high mobility. 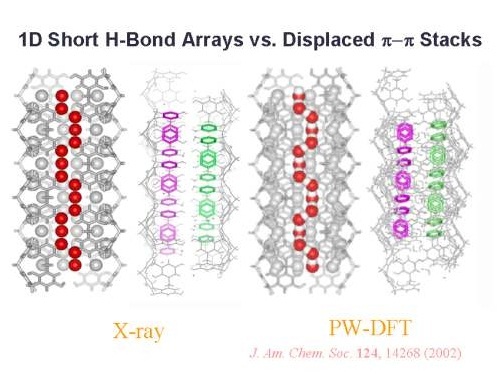 The unusual quantum Hall effect and Berry¡¯s phase, due to unusual quantum nature of confined electrons in graphene network, were observed. This work demonstrated the unusual quantum transport phenomena in quasi-quantum electrodynamics on two-dimensional fermion system. The peculiar behaviors are essentially caused by massless Dirac fermions and the nontrivial topology of the band structure in the graphene. Upon application of magnetic field, the n=0 Landau level forms at the Dirac point, reflecting the degenerate levels of an electron and a hole emerging from the nontrivial topology of a band structure of graphene. 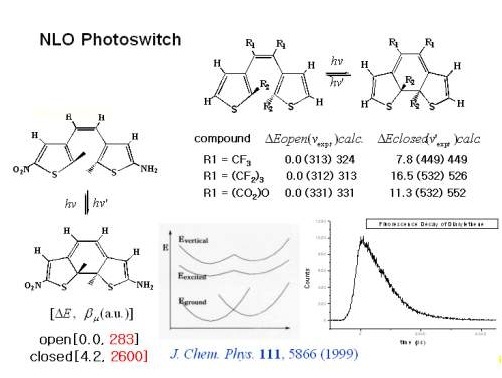 The promise of molecules in electronics comes from the diverse synthetic methodology in creating complex devices with unusual functionality. Despite this promise, fabrication of reliable single-molecule device has been technically challenging, in part, by ill-defined bonding between molecules and metal electrodes. 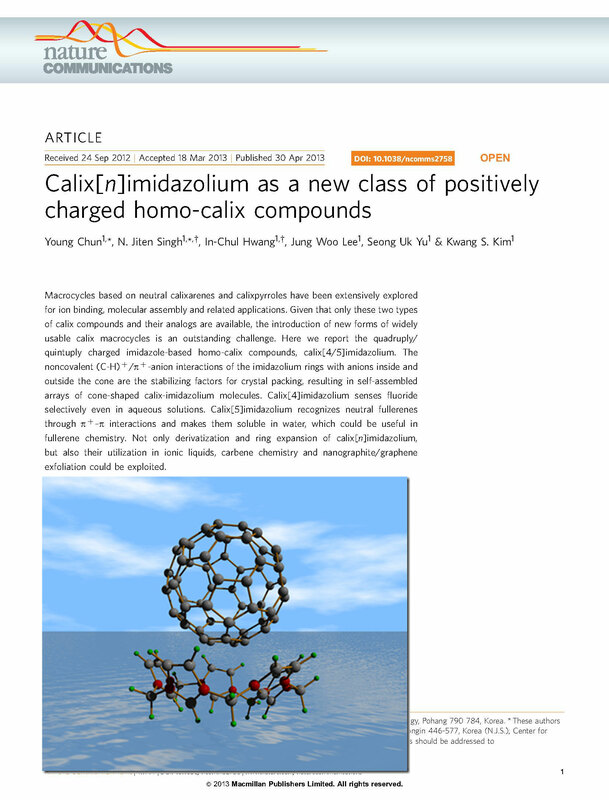 An improved strategy is needed to create a well-defined covalent bond between the electrode and the molecule. 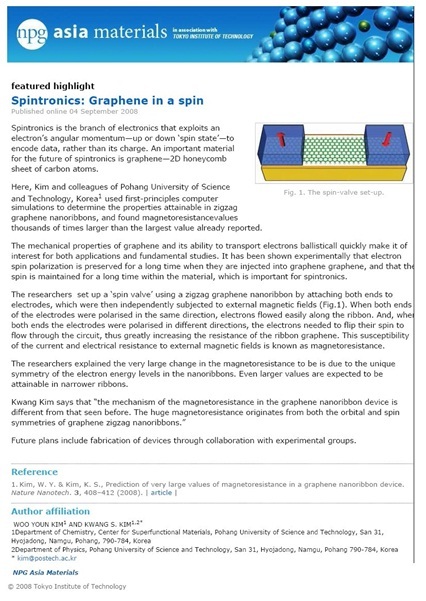 For the transport phenomena in nano-scale devices, charge and spin are two important degrees of freedom contributing the quantum transport. The electron transport through charge channels has been studied in various experiments. However, it is very difficult to achieve the spin transport through conventional spin channels in metal and semiconductors. 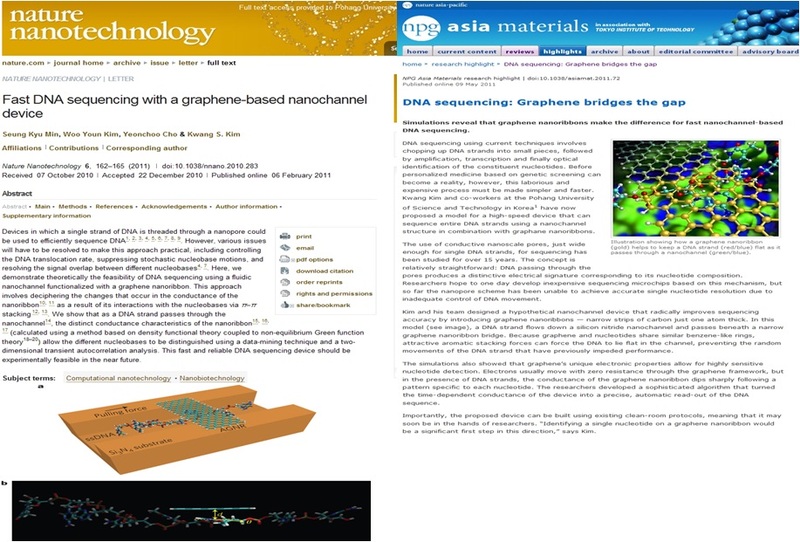 A graphene and a CNT, both of which are carbon-based systems, provide intriguing quantum transport phenomena. Although a CNT itself can be a spintronic device, a molecule and an impurity can be inserted as a scattering center on a CNT, as a molecular spin valve. We expect that a sandwiched spin-polarized molecule between crossed CNTs has the special feature of a magnetic tunnel junction. 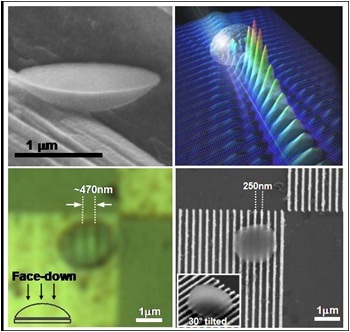 Utilizing the ultra-low friction between shell layers in a long multi-walled CNT (MWNT) due to the non-local nature of the ¥ð-¥ð dispersion forces, we have been successful in nanoscale engineering of MWNT structures by displacing outer shells one by one with AFM. This striking manipulation permits controlled modification of the electrical properties. 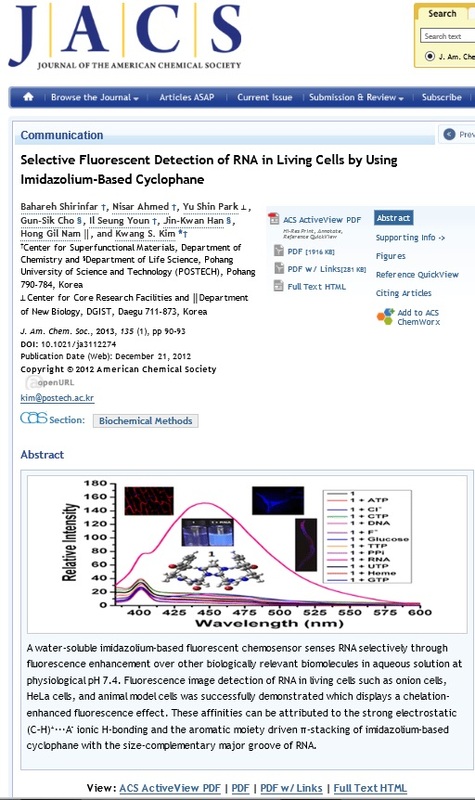 For example, thin single-walled CNTs (SWNTs) with diameter less than 1 nm are mostly metallic because of the sp3 character against the sp2 character of thick nanotubes. 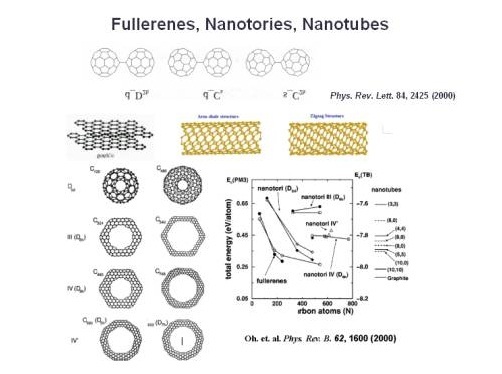 Recently, various inorganic nanomaterials with controlled shapes and properties have been developed. 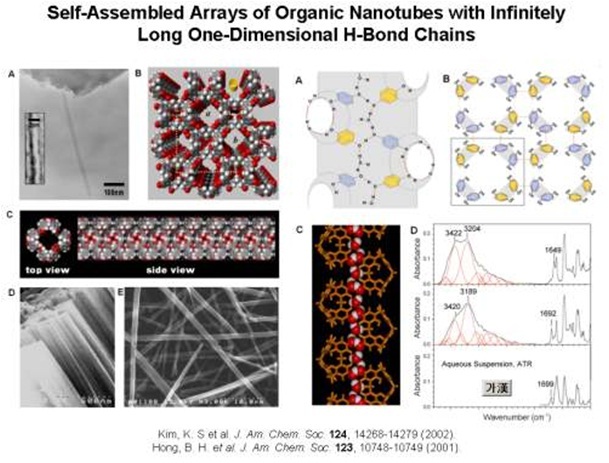 However, despite the diversity in self-assembling organic molecules, there is little progress in engineering morphologies of organic nanostructures. 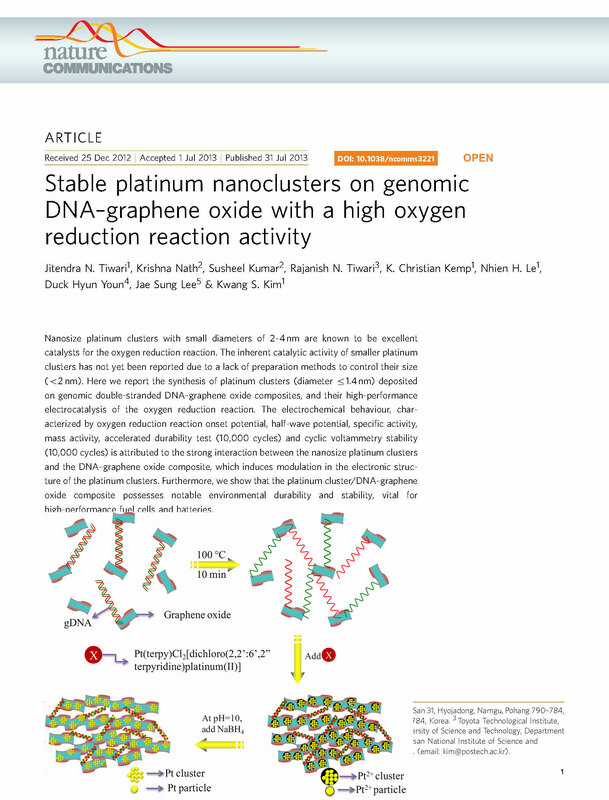 In designing nano-architectures by self-assembling organic molecules, the interplay between non-covalent interactions is more important than that in inorganic nanocrystals. Indeed, the strengths of the interactions in organic solids are comparable to those in solution phase. 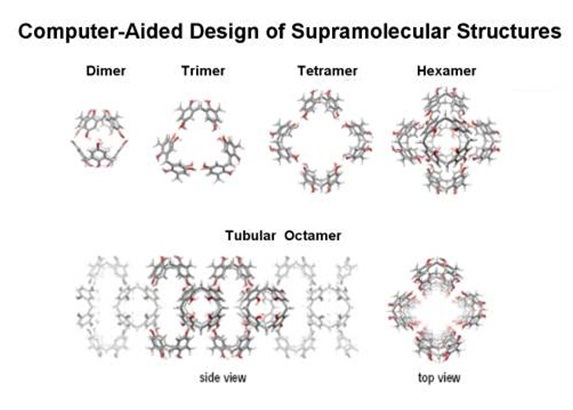 This results in a dynamic equilibrium that may enable the shapes of self-assembled structures to be controlled and optimized into their thermodynamically or kinetically preferred morphologies. Using this self-synthesis engineering technique, we can realize self-organizing intelligent nano-materials, electronic/spintronic nanodevices, nano-optical devices, and bio-nano-devices. 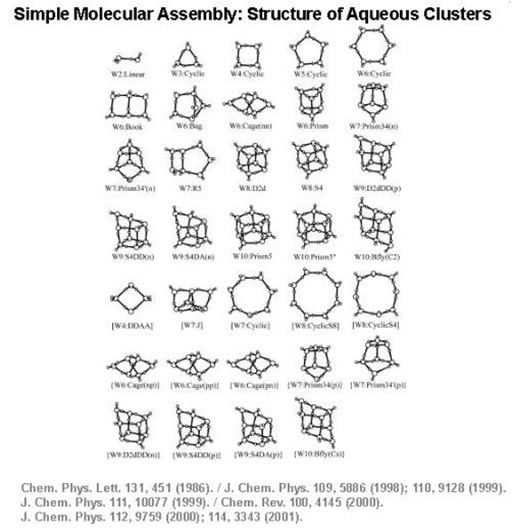 We also investigated the assembly phenomena including formation of molecular clusters and metal/alloy clusters, and the synthesis mechanisms and quantum phenomena in functional novel materials. It should be noted that intuition alone is generally impractical in designing nano-devices since the manipulation of quantum nature can be a subtle process. 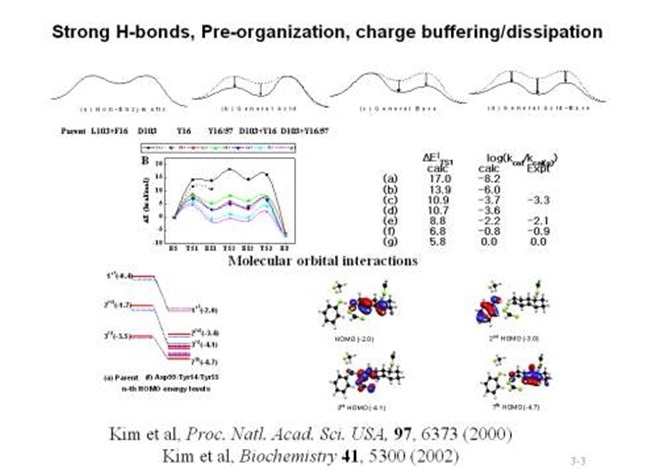 Thus, we design novel functional molecular systems through elucidation of molecular interactions, molecular assemblies, and electron/photon/proton capture/release/transfer mechanisms/dynamics. Thus, interatomic/intermolecular interactions are very important in self-engineering process and in designing molecular devices. Understanding electron/proton pathways in nano-systems using quantum computation helps design novel devices/sensors. 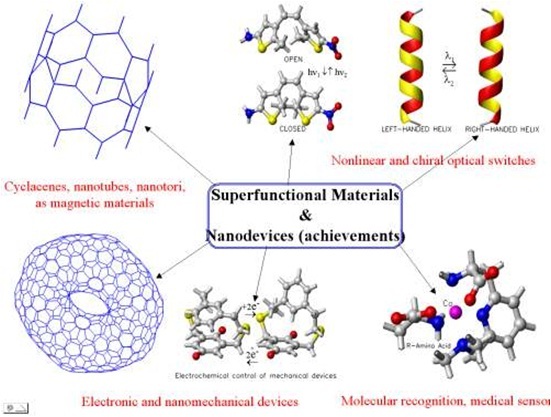 Through investigations of the governing forces and dynamics mechanisms in host-guest molecular systems and nanomaterials, we have designed novel types of superfunctional molecular/material systems and electronic/mechanical devices. Nanowires and CNTs can be utilized for bio-sensing, based on the difference in the transport property upon the binding of biomolecules. 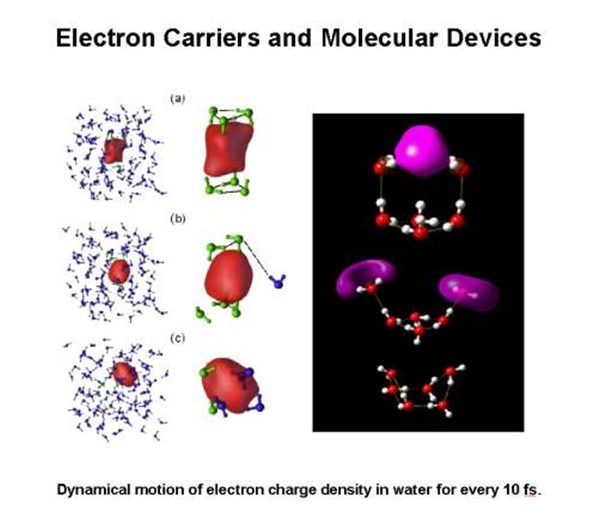 Implementation of the dynamics control for molecular systems would lead to the development of sophisticated molecular vehicles. Climate change such as global warming is believed to be a result of an enhanced green house effect mostly due to an accumulation of greenhouse gases in the atmosphere. The development of novel low carbon technologies such as capturing and storing CO2 from industrial point sources for various commercial applications is highly desirable for sustainable development. Besides, towards a hydrogen economy is one of the major worldwide projects to solve the global demand for clean energy.